Hey all! 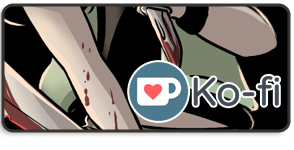 Hope you had a happy weekend/holiday <3 We're $30 out from an extra page, so no page today, but Thursday has an update scheduled! The updated total is $206 (meter)+124(books/stories)=$350, +$35 for another extra page next Monday, total of $385. 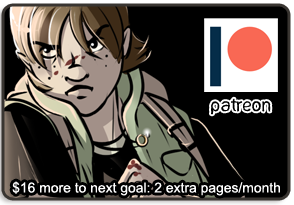 That's the last extra page I'm offering for awhile, it's close enough to the goal of $400! The drive continues until THIS friday (Sept 6), when I'll do the drawing for the piece of What it Takes original art. Still haven't forgotten about the wallpaper either, no worries! <3 Thanks so much for all the support! Arc 13 is over is another 3 pages! Arc 14 is titled "Peter's Middle Name." There's a pretty big reveal coming up though, so stay tuned! BWAH HAH HAH. Remember, no comic on Labor Day (monday), but hopefully on Tuesday, and definitely on Wednesday. I'll do the raffle drawing next Friday (so if you want to be in the drawing for it, you have to donate/buy something by then!) for the original piece of What it Takes art, and hopefully get the donator wallpaper finished this weekend. :) Have a good weekend folks!